If you have daffodils that grace your yard, but there are circumstances that require you move them to a different location, there are a few points you should consider. The best time to move daffodils is when they are dormant, which is after the flowers have bloomed and the foliage has turned brown. If you must move them when they are active, there is a chance that they will not bloom next season, as the bulbs will be expending their stored energy to adapt to the new location. It is possible to move them when active, just not advised. Whether you move active or dormant daffodil bulbs, the process is simple but you should follow a few basic steps. Check the condition of your daffodils. 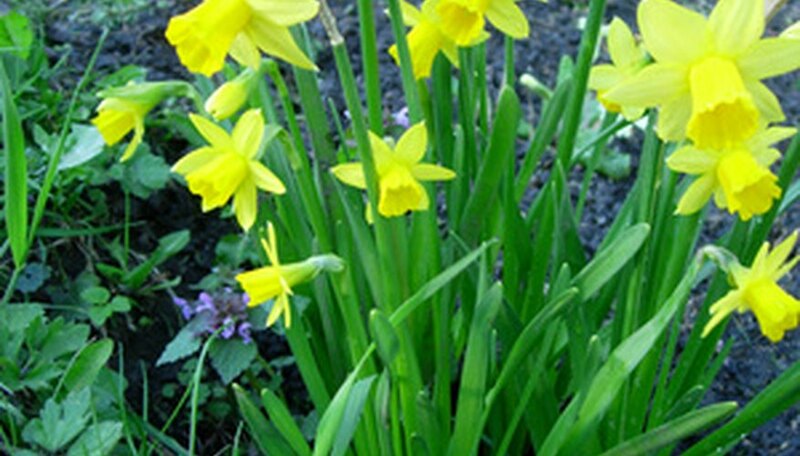 If the daffodil leaves are still green, do not cut them off, but simply move the bulbs with the leaves on them, as the leaves give the bulbs their energy for next season's bloom. Dig the bulbs out of the dirt with a spade. Be sure to go at least three to four inches out from the stem so that you don't dig down into the bulbs. If there are several stems close together, dig down gently on one open side and lift the dirt slowly until you can locate exactly where the bulbs are. Lift the bulbs out of the soil, and if there are some that are stuck together or that still have dirt on them, leave them as they are. This will help prevent transplant shock. Dig the new holes for the daffodil bulbs. The depth of the hole should be the same depth as the original hole, and the width should be double that of the bulb. Add some slow release fertilizer to the daffodil hole, following directions on your particular brand of fertilizer, which can be purchased at any garden center. Plant the bulbs as they are, with some original soil still attached. When you refill the hole, tap the dirt gently but firmly down around the bulb. Water immediately. Dig the bulbs out of the soil, being careful to not pierce the bulbs. Clean off any excess dirt from the bulb, and if there are some that are stuck together, gently twist them apart. Lay the bulbs out on a layer of newspaper, and allow them to dry for two to three days. After they have dried, transfer them to a shallow box. Line the bottom of the box with a layer of bulbs, cover with a layer of newspaper and then add another layer of bulbs. Do not go more than three layers deep. Store the box of bulbs in a cool, dry location where rodents won't be able to get to them. Dig holes in the new location for the bulbs in the fall. The holes should be the same depth as the original holes, and twice as wide as the bulb. Add slow-release fertilizer to the holes, following package directions for your brand. Cover the bulbs with soil and water thoroughly. For stronger plants, add some slow-release fertilizer to the soil near the daffodils when they first start popping up in spring. Follow package directions for your particular brand. If your bulb location does not have adequate soil drainage, the bulbs may rot in the excess moisture.